The Religious Tract Society was founded in 1799 to publish and disseminate Christian literature. 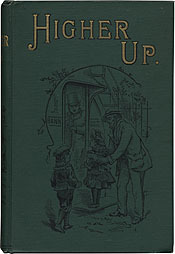 Since many of its publications were aimed at guiding the conduct of children, women contributed heavily to their production. Although frequently lacking depth and sophistication, the books could provide steady, if modest, income for female authors. In the 1860s, the RTS began making a conscious effort to brighten and secularize its output so as to appeal to wider audiences. These two childrens books, both by women authors, are typical of the eye-catching formats of later RTS publications. [top] Nellie Hellis. Higher Up. London, . [bottom] Rosa Nouchette Carey. 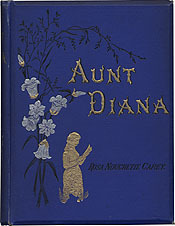 Aunt Diana. London, [ca. 1885].